It took me about 24 years to give exercise a try. It wasn’t until my mom duped me into a local race (that she positioned as a “walk,” btw) that I realized my body was capable of at least some movement without inducing imminent death. And when I decided I would try to see if I could survive a half marathon without dying, my whole life changed for the better. This also was all happening right as activewear was starting to get much cuter (at least in my opinion), and big athletic labels like Nike were putting a much bigger focus on women — I’m not ashamed to say that clothes totally accelerated my foray into athleticism, a journey that started as a hilarious experiment and ended up becoming the biggest part of my life, and led me to feel my most empowered. Why did it take me so long? Why did I think I wasn’t the type of girl that could be fit or strong? Why did I feel so isolated, and like a “girl like me” didn’t belong in the world of fitness? 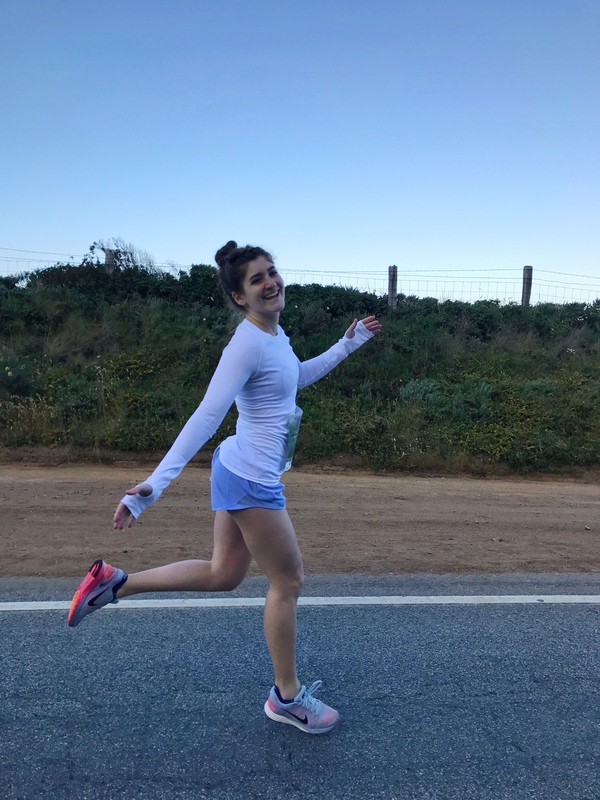 Though my personal fitness journey is only three years old, I’ve learned some really powerful things about myself, and what being a woman means to me, through my experience with exercise and health. Most importantly, that strength and femininity are not separate entities. Before we get into it, I realize that femininity means different things to different people. For me, at a very surface-level, it means my style, and my obsession with things that are pretty or stereotypically girly: pink and pastels, anything glittery or gold, Chanel, shoes, manicures, Britney Spears, mermaids, Instagrams of sunsets, etc, etc, etc. — so that’s what my mini epiphanies will be based on. I hope each of these lessons I’ve learned help you learn a little more about yourself, too. This discovery was 25 to 26 years in the making, honestly. I used to think that sweating was unglamourous; that dainty, girly-girls don’t work out. “That’s for athletic, sporty girls,” I thought. I have no idea where this mindset came from, but for so long I assumed that it was unladylike to get sweaty, unless you were a “real athlete.” You had to pick a lane… you couldn’t have both. But today, I feel most beautiful when I’m in my favorite pair of tights, a sports bra, sweating, and working my muscles. Aforementioned requirements: sports bra, tights, sweat, muscles. Maybe it’s thanks to the glamorous celebrities in SoulCycle, or that I’ve become obsessed with ultrafeminine activewear, or the fact that my Barry’s Bootcamp instructor looks magazine-cover-ready when she’s coaching our Sunday class, or how the Tone It Up girls love face masks and rosé as much as they love booty workouts and burpees, but suddenly things clicked and I realized that they don’t have to be separate. And that doesn’t just mean physical strength. Just like Elle Woods stormed into the courtroom wearing hot fuchsia head-to-toe (and totally OWNED that case), I show up at Barry’s or Bodyrok in hot pink Lululemon (or blush pink APLs). I didn’t have to compromise my femininity when I started going to the gym, and neither do you. In fact, I embrace myself more than ever. I didn’t need to fit a certain athletic aesthetic or look — I found my own. You can be strong AND love glitter and the color pink. You can work on your muscle tone and how heavy you can lift, and still love rocking out to Britney Spears. 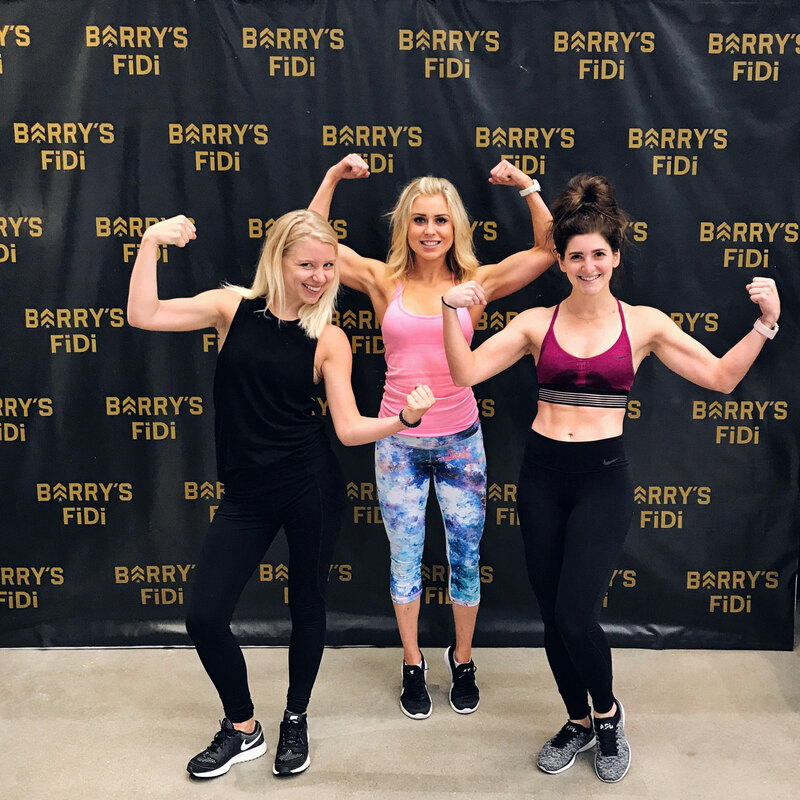 You can go hard in a bootcamp class, shower, and spritz on your favorite Chanel perfume before heading to brunch (or wear your Chanel mascara during a half marathon, I won’t judge you!). These aren’t separate worlds. In fact, embracing your strength — physically and mentally — will only serve to heighten your femininity and highlight the best parts of you. Just like Elle. God, that movie was inspiring. Embracing your femininity — whatever that means to you — also doesn’t mean people won’t take you seriously. You’ll get equal attention, respect, and instruction from a trainer in pink boxing gloves or in black ones (trust me on this one). Keep in mind, it also doesn’t mean you don’t take yourself seriously. There’s a ridiculous misconception that equates a style — one that mostly women identify with — with being childish or not serious (another stigma Legally Blonde challenged, now that we’re on the subject). That’s lame. I took myself and my first half marathon VERY seriously and so did my Mariah Carey playlist and Tiffany blue sports bra. In fact, I kind of hate sports. I’m sorry, but unless I’m there watching a live game from a stadium, sports are boring AF. And playing sports??? HELL nah. I’m not competitive! I wrongfully assumed for years that because I wasn’t interested in sports, there was no reason for me to exercise. As such, I missed out on years and years of an activity that today brings me endless joy and a daily mental boost. Even when I first started exercising, I thought some workouts were for girls, and some were for guys — WTF? And while our bodies are inherently different, the idea around gender-specific classes or styles of exercise is a joke. A barre class can totally destroy a dude’s will to live, while a girl can totally crush a martial arts class or a CrossFit session. Fitness is for everyone. 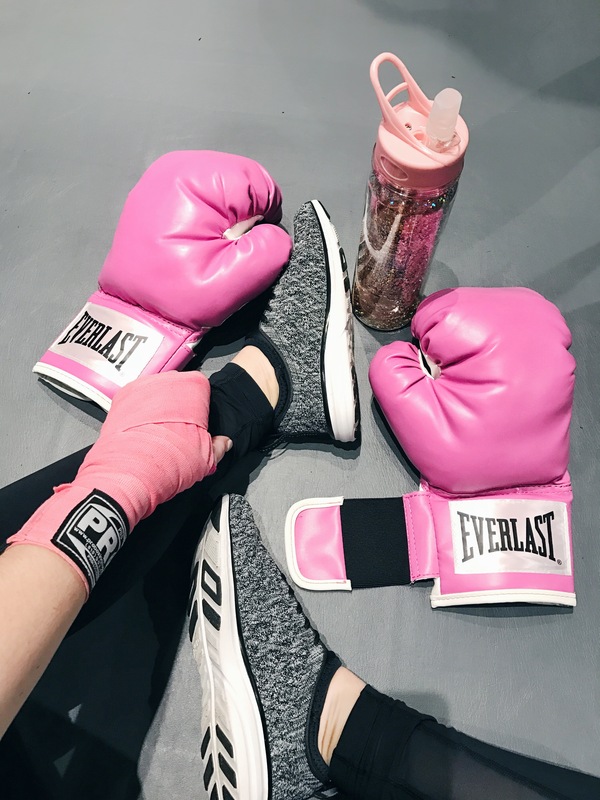 I used to think boxing was a manly sport, until I showed up with my hot pink Everlast gloves and let loose on a heavy bag. It was one of the highlights of my year. I’ve never felt more confident or beautiful than I do now — and I wear less makeup than I have since the 8th grade! Strong is beautiful. Healthy is beautiful. Confidence is beautiful. Feeling good is beautiful. Think about it: when you’re feeling yourself, you’re radiant. When are you feeling yourself the most? When you’re crushing a workout, earning more confidence, making yourself proud, squashing your self-doubt, and getting yourself in rockin’ shape. Getting stronger and focusing on my health in this way has made me more empathetic, open, supportive, kind, and positive; to me, those qualities are also hallmarks of femininity. So through my strength, I probably became MORE feminine. Imagine that! It took me decades to learn this, and my hope is that younger women learn this sooner than I did. The strength I’ve developed over the past few years has made me my best, happiest self, and I didn’t have to compromise one iota of my pastel-loving personality; I just celebrate it in a new way. I love this post Dom! I love how the fitness industry finally started to cater a bit more to women. I participated in a couple of team sports growing up…but I’d agree with you on sports not really being my thing either.